Transformers are constructed so that their characteristics match the application for which they are intended. The differences in construction may involve the size of the windings or the relationship between the primary and secondary windings. Transformer types are also designated by the function the transformer serves in a circuit, such as an isolation transformer. Distribution transformers are generally used in electrical power distribution and transmission systems. This class of transformer has the highest power, or volt-ampere ratings, and the highest continuous voltage rating. The power rating is normally determined by the type of cooling methods the transformer may use. Some commonly-used methods of cooling are by using oil or some other heat-conducting material. Ampere rating is increased in a distribution transformer by increasing the size of the primary and secondary windings; voltage ratings are increased by increasing the voltage rating of the insulation used in making the transformer. Power transformers are used in electronic circuits and come in many different types and applications. Electronics or power transformers are sometimes considered to be those with ratings of 300 volt-amperes and below. These transformers normally provide power to the power supply of an electronic device, such as in power amplifiers in audio receivers. Control transformers are generally used in electronic circuits that require constant voltage or constant current with a low power or volt-amp rating. Various filtering devices, such as capacitors, are used to minimize the variations in the output. This results in a more constant voltage or current. 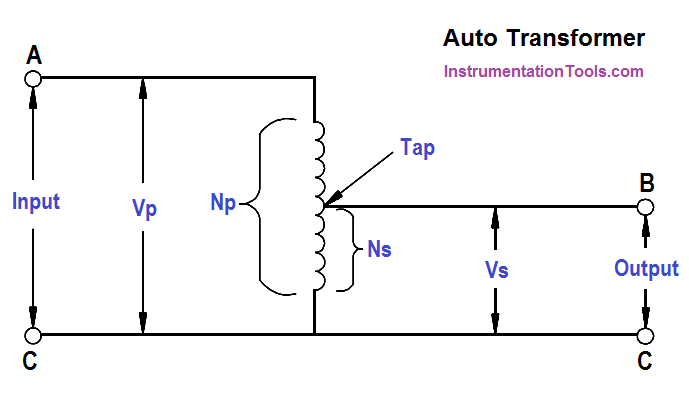 The auto transformer is generally used in low power applications where a variable voltage is required. The auto transformer is a special type of power transformer. It consists of only one winding. By tapping or connecting at certain points along the winding, different voltages can be obtained (as shown in Figure). Isolation transformers are normally low power transformers used to isolate noise from or to ground electronic circuits. Since a transformer cannot pass DC voltage from primary to secondary, any DC voltage (such as noise) cannot be passed, and the transformer acts to isolate this noise. The potential transformer (PT) steps down voltage of a circuit to a low value that can be effectively and safely used for operation of instruments such as ammeters, voltmeters, watt meters, and relays used for various protective purposes. The current transformer (CT) steps down the current of a circuit to a lower value and is used in the same types of equipment as a potential transformer. This is done by constructing the secondary coil consisting of many turns of wire, around the primary coil, which contains only a few turns of wire. In this manner, measurements of high values of current can be obtained. A current transformer should always be short-circuited when not connected to an external load. Because the magnetic circuit of a current transformer is designed for low magnetizing current when under load, this large increase in magnetizing current will build up a large flux in the magnetic circuit and cause the transformer to act as a step-up transformer, inducing an excessively high voltage in the secondary when under no load. What is a transformer tap changer?